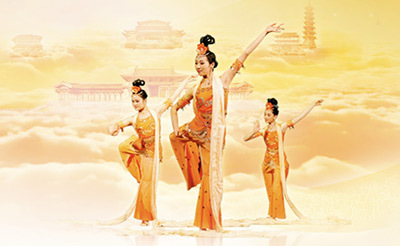 Every costume in a Shen Yun performance is presented with brilliant colors, displaying a splendid spectacle—from the Tang Dynasty’s “Raiment of Rainbows and Feathers” to imperial dragon robes, phoenix coronets, and cloud capes; from the civil official’s headdress and robes to the warrior’s helmet and armor; and from the traditional rightward cross-collared Han clothing to the ethnic attire of the Manchurian, Tibetan, Dai, Mongol, and Uyghur ethnic groups. 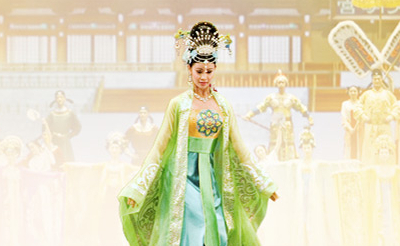 Shen Yun’s costume artists collect countless designs of traditional attire, ranging from those of emperors, ministers, and generals to the everyday clothing of the common people. They use bright colors to tailor and recreate hundreds of new pieces each season. Every detail is given meticulous attention and is a result of artistic inspiration and careful polishing. The designers stress harmonic balance and contrast. Their objective is an authentic presentation of the attire that comes from China’s divinely inspired traditional culture, and a consummate stage effect.